The sheer size of this shed is extraordinary. It is one of the largest wooden sheds available and will therefore be able to handle a very wide selection of tools, equipment and machinery. However, it is advised that you upgrade the floor if heavy items will be kept in the building. In order to ensure plenty of lighting gets into the workshop, six large styrene glazed fixed windows have been included. It’s important to note that these cannot be opened so ventilation could be a problem in hot weather. However, leaving the doors open will help to air it out and prevent potential mould problems, as well as making it more comfortable to use. The doors have a braced design which is unique for an overlap building. It essentially stops them from sagging and helps to boost the overall quality of the workshop. A 10 year anti rot guarantee is included though you will need to maintain annual treatments for this. Overall it is an incredible value building that is fantastic for those with light-medium weight storage requirements. Obviously you will need to have a big garden to fit this building but compared to other models it does have some great benefits. The Shed-Plus collection is known for its high quality design and this huge building is a good example of that. 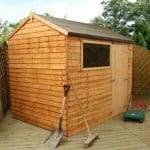 Although created from basic overlap, there are many features of this shed that make it stand out from the competition. Being one of the largest sized buildings on the market, it gives you the opportunity to use it for a number of purposes. In terms of measurements, though the door width isn’t as impressive as some of its competitors, the double doors still reveal very wide access to transport various sized items. 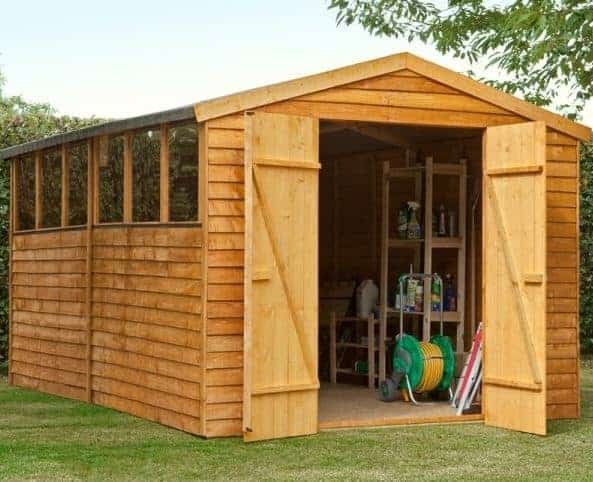 The height of the shed is also brilliant, ensuring no matter how tall you are you will be able to comfortably walk around inside without banging your head. 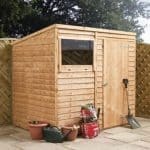 What you’ll notice about the roof of this shed is that although it has an apex design, it does have a much gentler slope than more traditional models. This is to accommodate its huge size and also ensures the additional height isn’t just located throughout the central part of the building, but throughout the entire interior. It is covered by a basic mineral felt and constructed from OSB material. The floor is also made from OSB materials. 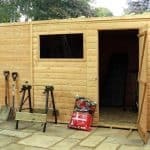 Now this is surprising in the fact that some similar competitor sheds have a slightly thicker floor to make sure they are better suited for use as a workshop. However, taking into account the cost it is understandable OSB has been used instead. All it means is that if you need to store anything heavy it is recommended that upgrades are made to make the floor stronger. A lot of people don’t realise there is more than one type of overlap cladding. The one used on this building is the traditional, highest quality kind. Square cut timber is nailed over the top of one another to create the distinctive overlap design. Whilst it may not be as strong as Shiplap tongue and groove, it is weather resistant once treated and will still last up to 10 years in accordance with the 10 year anti rot guarantee. A 28mm x 28mm frame keeps the interior stable. Both the cladding and framing are created from European softwood. Prior to being shipped, the timber is dip treated so that it will not get damaged before it reaches you. It is advised that you treat the shed after installation as well as every year after that. We would have been surprised if this building didn’t come with double doors. 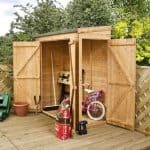 Though their width do fall short of the standard 2’2” shed doors, as you will see from the picture you are still granted a huge amount of access to the interior storage. This means you will have no problem getting whatever you need to store in or out of the building. A nice surprise is that these doors are braced. Cheaper overlap sheds tend to cut costs wherever they can and door bracing is a luxury they do not usually include. So this is one thing that sets it apart from other models. Another unique design feature that sets this shed apart is the six large styrene glazed windows. They provide the maximum amount of natural lighting possible into the building, though they are fixed so you won’t be able to open them. They can be assembled on each side of the building. When you compare this to other similar models, it does feature slightly more security than most. This is thanks to the strong pad bolt attached to the double doors. Whilst alone they will not lock the building, you can buy a padlock to ensure they are strongly protected. The only thing that will cause problems is the windows. They cover one entire side of the building so privacy is extremely limited. You also won’t be able to install blinds or curtains. The only thing you can do is make sure you install them on the most private side. Four extra options are provided with this shed. The security extras are one of the most valuable to consider, consisting of a single alarm padlock or a full security kit. There isn’t much difference in price between the two so it will largely depend upon personal preference. The security kit is offered by industry leader ‘Yale’ and it includes a hasp and staple, padlock and an alarm. The alarm padlock on the other hand has an alarm built into it. Both will deter thieves and help to keep your storage fully secure. Two treatments are also offered and we would highly recommend them. Due to the size of the shed we would advise that you buy at least two tubs. There’s a choice of dark brown or harvest gold colours and they have been designed to be used on rough sawn sheds. They come at a very low cost and will provide adequate protection for around a year. The solar light could be a great choice if you plan on upgrading the building to use it as a workshop. This very affordable strong light will power up naturally via a remote solar panel. It is very easy to install and each light benefits from an amazing six LED bulbs. Finally if you’re hoping to organise your storage and keep wires and power tools off the floor, the pack of 4 overlap hooks are a great choice. They slot between the overlap panels and can handle light to medium weight objects. Considering this building is largely constructed with low cost in mind, it does offer a great quality design. There are little things that set it apart from most overlap sheds including the braced doors. Without treatments, this shed wouldn’t last long. However, when treated annually you are given a 10 year anti-rot guarantee. You will struggle to find a more spacious shed on the market. This gives you a fantastic amount of space to store practically anything. Obviously the size of this building is going to make it more difficult to assemble. However, customers have also reported that the sizes and measurements printed in the instructions is also wrong. On the plus side, the panels are well made and fitting them together is easy enough. We’re surprised just how affordable this huge shed is. Floor bracing is highly recommended so this will take the cost up a little, along with the annual treatments. 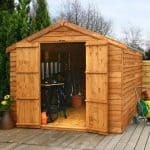 However, overall it is one of the best value for money sheds we’ve reviewed. Final Thoughts: It’s hard not to be impressed by the size of this workshop shed. 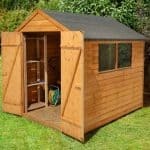 Offered in the Shed-Plus collection, this shed is built with both budget and practicality in mind. It offers great interior height, a 10 year anti-rot guarantee and a substantial amount of storage space. Benefitting from 6 large windows, lighting will never be a problem throughout the day. Though built from basic materials, the building is still reliable and boasts great longevity providing it is maintained properly. The braced double doors are a great addition and ensure you won’t have to worry about sagging no matter how frequently you use the building.